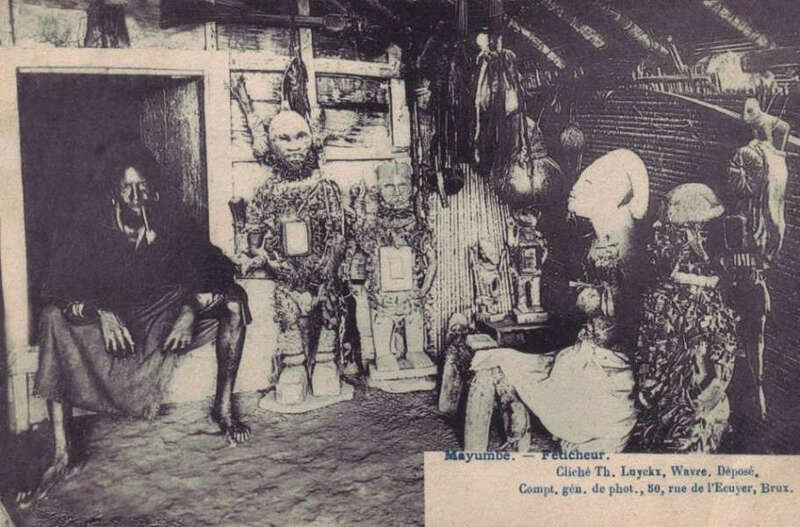 Above a fantastic old postcard, previously unknown to me, showing a collector of African art specialized in Kongo nkisi nkondi smoking a pipe in his living room. 🙂 I count four big statues, two smaller in the corner and a dog on the ground in front of them. On the right, there also appears to be hanging a zoomporphic figure on the wall. I have never see so many figures together owned by a single diviner. 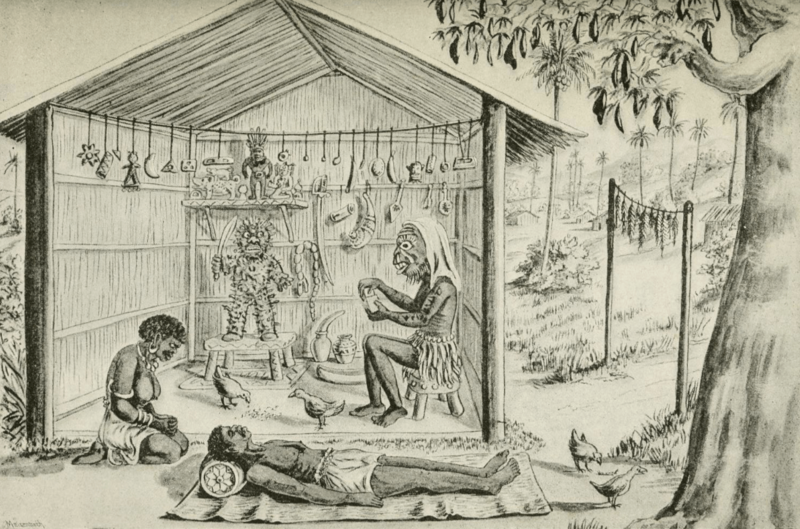 This picture somehow reminded me of Dennett’s drawing of a Vili diviner at work, as illustrated in his Seven years among the Fjort and shown below. This entry was posted in Research and tagged Yombe on September 2, 2014 by admin. 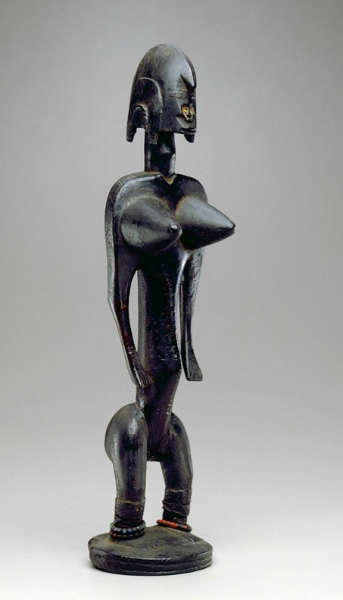 Yombe maternity figure. Height: 28 cm. Image courtesy of Sotheby’s. Kathryn Gunsch has been appointed as Teel Curator of African and Oceanic Art at Boston’s Museum of Fine Arts. She starts on Sept 22, 2014, and will oversee the MFA’s growing collection of art from Africa and Oceania, which is displayed in the new Benin Kingdom Gallery, as well as the recently re-installed Arts of Africa Gallery and the upcoming Arts of the Pacific Gallery, opening on Nov 12th. Gunsch comes to the MFA from the Baltimore Museum of Art, where she served as Department Head for the Arts of Africa, Asia, the Americas and the Pacific Islands. She completed her Ph.D. at New York University in 2012, with a dissertation on the bronze plaques from the ancient Kingdom of Benin – complementing the MFA’s recent acquisition of 32 Benin objects from the Robert Owen Lehman Collection (info). Gunsch replaces long-time curator Christraud Geary, who retired in 2013 after 10 very productive years at the Museum. Geary was the Museum’s first Curator of African and Oceanic Art, and is now Teel Senior Curator Emerita. Sotheby’s New York announced that it will be selling the Myron Kunin collection this November (info, often listed as ‘Curtis Galleries’ in catalogues). This single owner sale will number approximately 190 lots, estimated to fetch $ 20-30 million – a record for an African art auction in the US! 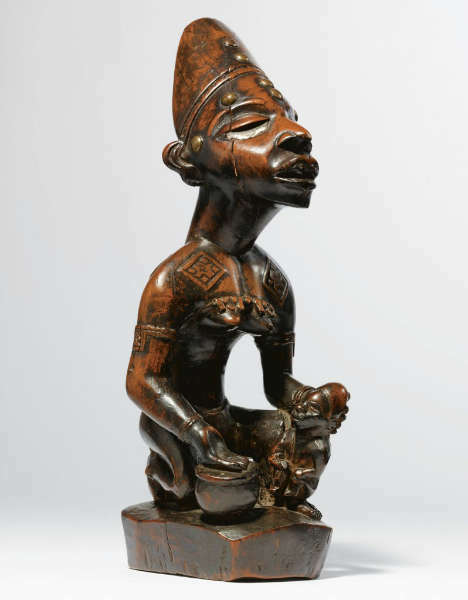 The collection includes several lots acquired fairly recent at Sotheby’s, for example the Yombe maternity figure from the Robert Rubin collection, bought by Kunin in 2011 for 1,874,500 $ (now estimated $ 1,5-2 million) and the cover lot from the 2009 Chaim Gross sale, a Ngbaka figure which sold for 1,258,500 $ (now estimated $ 1,2-1,8 million). Both objects were hammered down at record prices – I wonder if it’s not too soon to redo this incredible achievement. The same applies to a small Vili figure which Kunin acquired in 2008 for 289,000 $ (estimated $ 30-50,000) – will the underbidder be back for this little gem? A Fang head bought in 2002 for 449,500 $ and published in Carl Einstein’s groundbreaking publication Negerplastik in 1915, is estimated $ 600-900,000 and will certainly receive a lot of attention. Most recently this head was on view at the Metropolitan Museum of Art in Yaëlle Biro’s exhibition African Art, New York, and the Avant-Garde. There are much more blue-chip artworks in the Kunin collection; the guy definitely had taste, and the means to pursue it. As always, the best budget is no budget – let’s hope for Sotheby’s the same will apply to their bidders. Highlights will be on view in Paris from 9-22 September. Lastly, I was threatened with a lawsuit for posting a story about a fake mask – the first time I did that by the way. Last year, I had already written about the growing reluctance of art experts of expressing their opinion freely – read more about it here. I now experienced first hand how far people wish to go to silence somebody. This entry was posted in Auctions, Museums, News, Opinions and tagged Yombe on August 11, 2014 by admin. Christie’s sale of the Rudolf & Leonore Blum collection last week did very well. The sale made € 2,978,200 (excl. premium), just above the total high estimate of € 2,919,000. Single owner auctions always tend to perform better than various owners sales. 56 (or 89 %) of the 63 lots were sold. But, important to remark, about half of those objects were sold under their low estimate. The reserves were very low so the heirs must have been keen not to have any objects back. The bidding for an excellent bronze Yoruba bell from the Ortiz collection for example started at only € 2,000 – while it was estimated € 15,000-20,000 – and a lucky bidder could buy it for € 3,800. A Mangbetu box, estimated € 12,000-18,000 sold for € 3,200 (excl. premium). 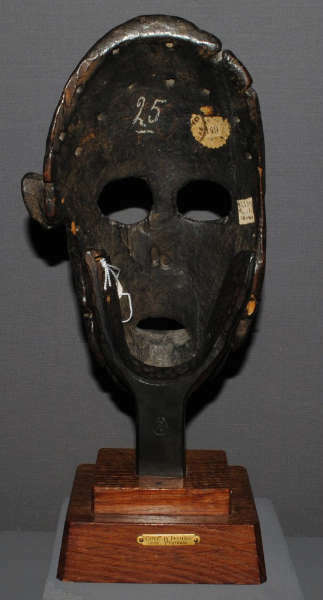 The only reason why 7 lots remained unsold is because nobody bid on them, even at a very low reserve (€ 2,000 for the excellent Yoruba mask, lot 29, for example); otherwise this would have been a sold out sale. 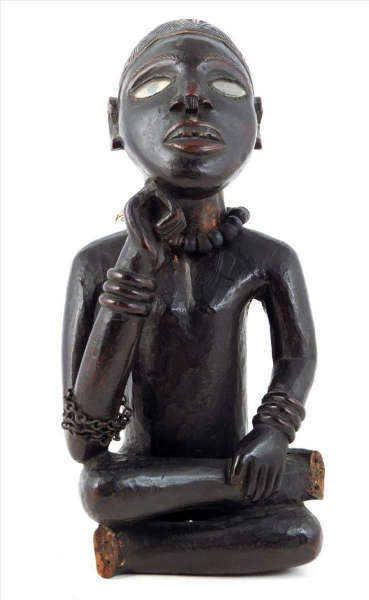 What I did enjoy to see was that some lots, while starting very low, like the enigmatic Cameroon figure (lot 38) at € 20,000, did sell within or just above their estimate (€ 72,000 without costs with an estimate of € 50,000-70,000 in this case). This shows that buyers — or their advisers — these days do their homework scrupulously and no matter what the starting price is, a piece is sold at its value. What made this sale, was a small group of high quality objects. About 25 % of the lots were sold above the asking price. A Bamana mask (est. € 60,000-80,000) from a known hand sold for € 210,000 (excl. premium) to a telephone bidder. The Senufo maternity figure (lot 11) doubled its low estimate and sold for € 440,000 (excl. premium). One of the biggest surprises of the sale was the Benin aquamanile in the shape of a leopard (lot 26) which sold for six times it high estimate at € 420,000 (excl. premium). Another surprise was a Mangbetu drum (lot 48) which sold € 100,000 above its high estimate at € 135,000 (excl. premium) – 1875 being an extremely early collection date for such an object. The cover lot, a Luba-Shankadi headrest (lot 58) sold for € 550,000 (excl. premium); I had expected that it would sell for more. The star of the sale for me was the Yombe maternity figure (lot 49), a steal for € 65,000 (excl. premium). Its masterly carved scarifications and charismatic head with beautifully rendered facial traits for me make it one of the best examples of its kind. Curiously enough, the child in the mother’s lap appears to be grasping his own right foot; one can only wonder what that originally meant. Christie’s various owners auction that followed the Blum sale was not as successful. The total sale made € 1,268,800 (excl. premium), with a total low and high estimate of € 1,159,800 – € 1,698,000. The reserves being much closer to the low estimate, about half of the 66 African art lots remained unsold. Of the 34 sold lots, 12 ended under the low estimate, 11 between the low and high estimate, and 11 above the asking price – very well balanced thus. Paul Guillaume’s Dan mask, sold for ten times its high estimate at € 600,000 (excl. costs). An old metal label on the Inagaki base on the back (which used to hang on the front) stated this mask was from the 5th century (see the picture below). Surely, it wasn’t that old, but it dated certainly from the mid 19th century – which is ancient for a Dan mask. It’s incredible result shows that prices continue to reflect not only the intrinsic value of objects, but the quality of their history as well. An object that missed such an illustrious provenance and publication history, the Fang monkey featured on the catalogue’s front cover, thus not suprisingly stayed under its low estimate of € 80,000 and was hammered down at € 65,000 (excl. costs). Another important lot, the Punu mask (estimated € 180,000-200,000) was sold for € 120,000 (excl. premium). A Songye kifwebe mask (lot 200) (est. € 50,000-80,000) sold for € 140,000, while an Hemba ancestor figure (lot 201), published by François Neyt and estimated € 150,000-250,000 failed to sell. This sale again illustrates how selective buyers are these days. The Dan mask alone was responsible for almost half of the total result. In my view one can say a lot on the current state of the market for African art, but one thing one can not say is that it is growing. This entry was posted in Auctions, Opinions and tagged Yombe on June 24, 2014 by admin. Ernst Ohly, Berkeley Galleries, London. Image courtesy of Woolley & Wallis. One of the lessons of last year was the fact that if an object had quality, it didn’t matter how obscure the auction was, it would reach the same price as it would do in Paris or New York. This was shown again last Tuesday, when Woolley & Wallis in Salisbury (England) sold the above Yombe figure at ten times it lowest estimate. Appraised at £ 4,000 – 6,000, it was hammered down at £ 44,000. More info and pictures here. 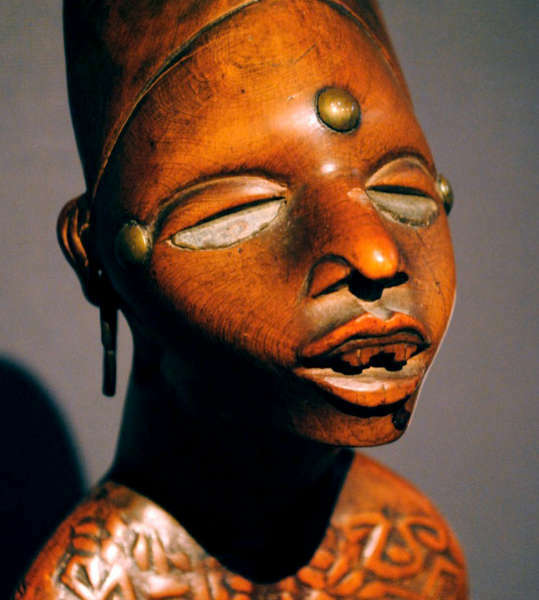 These great commemorative effigies of Yombe chiefs are very rare and are celebrated highlights in several major institutions, such as the Metropolitan Museum of Art in New York or the Tervuren museum. Although the identity of the chiefs they commemorate is now lost, these statues were sculpted in order to perpetuate the memory of the great characters they enshrined and were worshipped as part of a cult based on the notion of continuation and preservation of lineage. This chief’s status is marked by the large proportions, ornaments worn on the arms, the finely woven cap with intricate geometrical patterns (mpu) – worn exclusively by the chief – and the stance. In fact, the Yombe statuary expresses, through the figures’ poses, the moral, political and religious codes of the Kongo civilisation they are related to (Lehuard, 1989: 108). If universal art history bears witness to the wealth of formal expresssions used to idealise the commemorated individual, the poses and gestures used here serve to express both the rank and ideal qualities of the chief. Although the stance – funda nkata (cross legged) – is a sign of respect (Lehuard, idem: 109), its combination with the position of the head resting on the hand “is the mark of a person who thinks before he speaks. Such is the figure of the ideal chief” (Thompson in Dapper, 2002: 92). This stance is also the one used in the funeral ntandi statues of the Kongo, which evoke, according to Tshiluila, describing a headstone held at the Tervuren museum, “the idea that the statue expresses and addresses the concern of a chief for his people” (in Tervuren, 1995: 283). This entry was posted in Auctions, News and tagged Yombe on February 14, 2014 by admin. 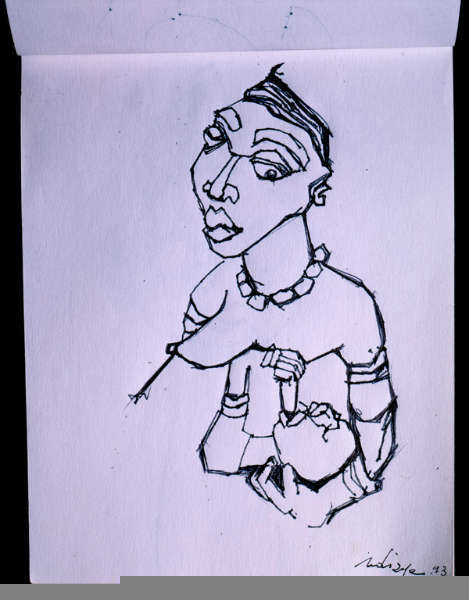 A wonderful drawing by Iba Ndiaye which I just discovered in the online presentation of the collection of the High Museum of Art in Atlanta (here). Included in this small sketchbook is a drawing of a nineteenth-century Kongo sculpture from the Yombe region of central Africa, in the collection of the National Museum of African Art, Smithsonian (see below). This drawing was made during the artist’s 1993 visit to Washington, D.C., where he made sketches and notes on numerous artworks ranging from ancient Minoan sculpture to works by Titian, Bellini, Van Dyck, Bacon, and de Kooning. All together, this small, 100 page notebook, originally purchased in the shop at the National Gallery (as evidenced by the dated receipt contained within) includes sixty-five sketches and notes. This entry was posted in Objects and tagged Yombe on June 11, 2013 by admin. Alarming news from Detroit, where the city’s $15 billion debt has led to the entire contents of the Detroit Institute of Arts being seen as a disposable asset by the city’s emergency manager. More details here and here. Right now no one knows exactly how much the collection is worth. A rough estimate is approximately $3 billion. It is somewhat taboo to appraise publicly owned art, as there is the belief it should not be put on the market. In the meantime, choose which piece of African Art you would buy in the presentation of the Africa, Oceanica & Indigenous Americas collection here. I love their Yaka figure, but my final decision would be this Bamana figure. UPDATE: please take note that Christie’s (Paris) is selling 14 African objects from the collection of the Art Institute of Chicago next month; see lot 61-74 here – with a special mention for this important Baga headdress. Many of them were only recently donated to the museum, so I guess there were given without restrictions that would prevent a sale. UPDATE 2: more recent news here. The objects illustrated in this post were or bought by the DIA itself or donated to the museum and thus can not be sold. This entry was posted in News and tagged Bamana, Yombe on May 24, 2013 by admin.